We receive a lot of questions from our customers regarding how to properly prepare and upload files to StationeryHQ to take full advantage of our digital printing services. Whether you’re creating custom note cards, customized greeting cards, digital letterpress stationery, wedding invitations or other personalized printed items, we can help you create high-quality products with your perfect design touch. 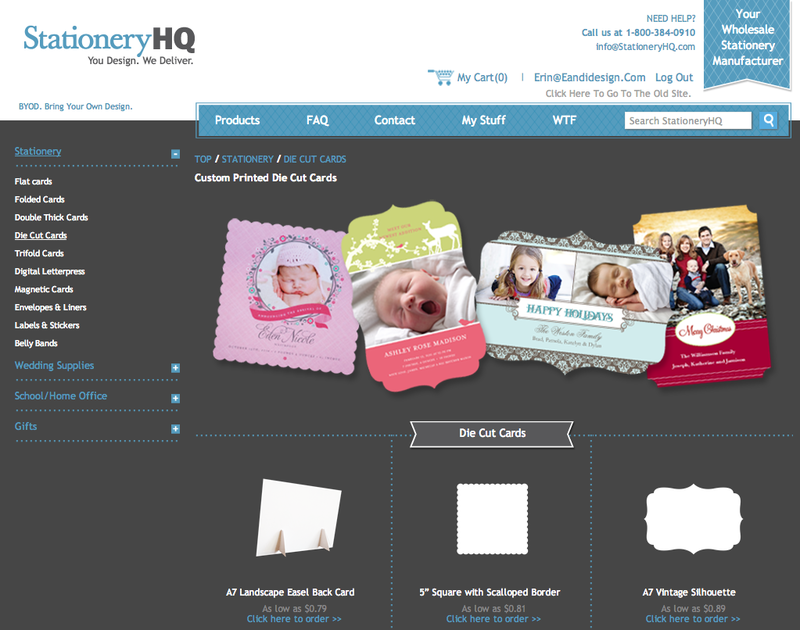 You can use our easy templates and online ordering system to create your own personalized designs. 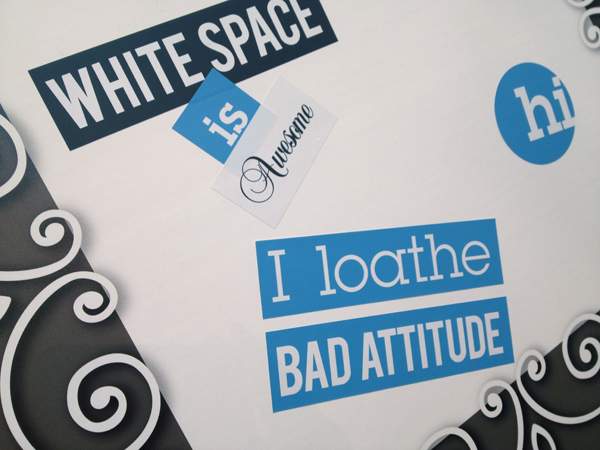 Want even more creative control over your custom stationery project? Not a problem. We can work with your unique designs, including die cutting, digital letterpress and more. Whichever production option you choose, just follow these five simple tips as you prepare your files for digital printing to ensure your personalized paper goods are printed exactly the way you want them—every time. 1. 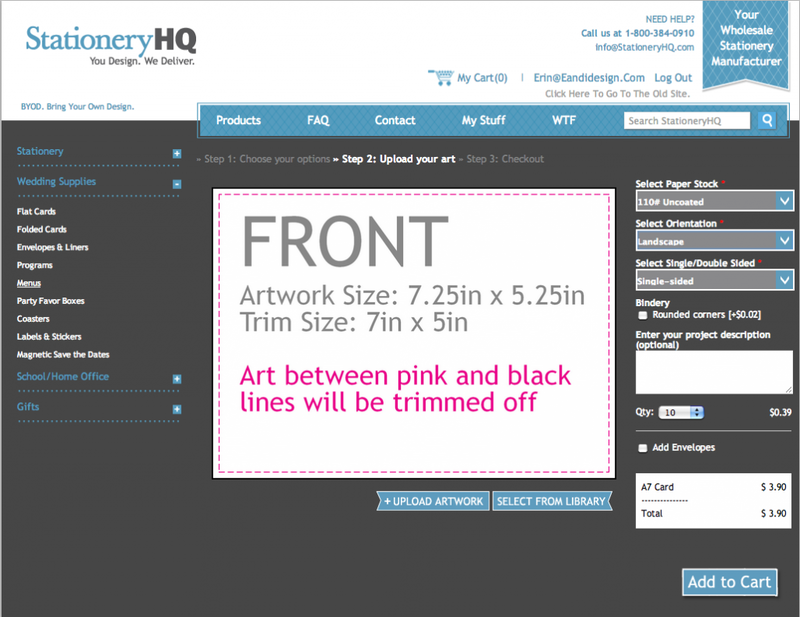 Sizing your artwork for digital printing. Make sure your file includes a bleed area on all sides. StationeryHQ requires at least 0.05 inches of bleed (0.125 inches is preferred) on each side to allow for trimming. Even if your project design is unprinted on all four edges, your production file should still include a bleed area. 2. Setting colors for proper printing. Convert all colors to CMYK—including PMS, spot colors and RGB—and make sure your document mode is set to CMYK. Please specify flat black (C=0, M=0, Y=0, B=100) instead of rich black. Any heavily saturated color should be under a combined CMYK value of 240. 3. Including your fonts. To ensure that your custom stationery project prints perfectly on our digital presses, please embed or outline all fonts. 4. Preparing file set-up. Don’t add “printer’s marks” such as crop marks, bleed marks or color bars. These will increase the document size, and you will not be able to upload your file, or your project will print incorrectly. 5. Saving a document for digital printing. Always save your document as PDF/ X-1A. This will flatten all the file layers correctly for our presses. Our customer service team is available to help if you have any questions about preparing your project files for digital printing. Please contact info@stationeryhq.com for assistance. Whether it be good or bad, customer feedback is always welcome here at StationeryHQ. When it’s a good comment sharing the joys of a successful job, we want to share our happiness with you, too! I am a frequent customer and just want to let you know how pleased I am with the quality of products and also exceptional customer service. I have had a batch of wedding invitation clients recently who had lots of requests for custom pricing on offline orders and it seems I have been flooding Jack’s inbox almost daily with questions and pricing requests. He has been so thorough and prompt and taken such good care of me (despite the fact that NSS is almost here and I’m sure everyone at the company is extra busy!) that I just had to write and let you know how grateful I am. So this is just a quick note to say THANK YOU to everyone at StationeryHQ! Ya’ll are killin it. I’ll be sure to stop by the NSS booth and I hope to be able to say thank-you in person, but please do pass this on to everyone since I know it takes a village. Thanks, Alisa, for making us smile. We strive to make every customer experience the best that it can be. Today, we’re kicking off a series of short videos that we hope will make some of your lives just a little bit easier. Many of you are new to the world of digital printing, having come to us from various other related backgrounds including letterpress and photography, and we even have some self-taught designers. So for some of you, setting up files which will print exactly the way you want has been rather challenging. Letterpress uses PMS and spot colors, which are pre-mixed ink colors. Your computer screen displays RGB colors, which are a combination of red, green, and blue light. Printing presses use CMYK inks – cyan, magenta, yellow, and black (also know as 4 color process) – to create all colors, but some RGB and PMS colors just can’t be reproduced in CMYK inks (these colors are known as “out of gamut”). When you convert your files to CMYK, you will see a shift in some colors. The ones which shift are out of gamut. Once you see this on your screen, you’ll have a pretty good idea of what the file is going to look like when it prints, so you can make adjustments to those colors if necessary. To avoid these kinds of surprises and the need to convert your files later, you can simply start your design in CMYK mode whenever you are creating a file which needs to be printed. Have any questions about this topic, or any suggestions for future topics? Please post them in the comments! Wow. Talk about overwhelmed in a good way. The team at StationeryHQ knew we had a lot to talk about this year with our faithful clientele and scores of newcomers, but I don’t think we were fully prepared for the incredible reception we received at the National Stationery Show in New York. Case in point. On Sunday, day one of the four day show, we ran out of almost all of our new double-thick paper samples. The ability to produce high-end imagery on Letterpress thick substrates is apparently a “yahoo” moment for the marketplace. The buzz around our technology offerings was extremely gratifying. Kudos to our development team and a big thank you to our beta testers and feedback from our user community. Case in point. Here’s a couple quotes from existing users comparing the old StationeryHQ site to the newly released site. We also shared our new CAPOW (Complete Automated Personalized Order Workflow) technology with a few larger customers who want to add real-time preview and/or distributed manufacturing. While this is a larger budget item for most, there is definitely a bigger pool of clients than we thought looking to solve these challenges for their respective websites. Case in point. An online retailer with a website offering 30,000 SKUs desperately wants to add real-time preview to compete with the bigger players in the marketplace and to improve their conversion rate. We really enjoyed the snark factor at the show. 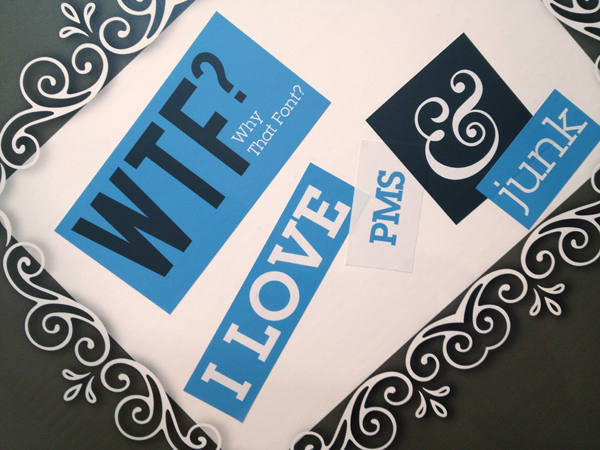 Some very helpful designers contributed to our booth decor with some witty word combos and big ideas. Thanks to those of you who took the time! The team at StationeryHQ wishes to thank each and every one of you for your continued support. It’s always such a great opportunity and a real pleasure to put a name with a face at NSS. We came away from the show inspired by designers’ requests for new products and processes and couldn’t wait to get back and start working on them! We look forward to supporting your stationery and gift needs and helping you solve your business challenges. See you next May, or hopefully sooner. I would like to personally extend a warm welcome to all of our visitors here at StationeryHQ. I know that with a new website comes some growing pains and confusion, so here is the first walkthrough in our new video series to help clear them away. In this video, I guide you through the new site layout, covering product location, logging in, and help outlets. Hi, I’m Chris, the CTO over here at StationeryHQ. 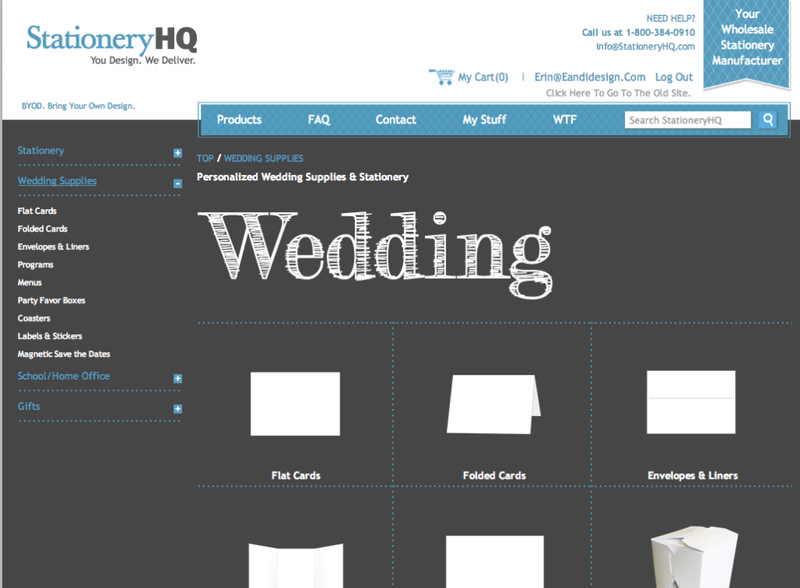 This has been a really exciting two weeks for us in the programming side of StationeryHQ.com. Soon after launching the site, we started getting reports that the shipping was occasionally much more expensive – especially on small orders. Since launching the site, we have reweighed all of our products to make sure our weights are accurate. We have reviewed how the old site does shipment quotes and how the new site does shipment quotes. Before today, the answer was “Definitely not.” The new site was over charging in some instances and under charging in others. The old site was undercharging ALL USPS postage because it was using a 3 year old rate table. The UPS quotes on the old site were also wrong because we did not have accurate weights in for the products. Sometimes, the weights were off as much as 16x UNDER the actual weight. This meant that many of the most popular products were being offered USPS First Class when we could not send it that way. It also meant that the shipment quotes, especially on Priority Mail and 2nd Day or Overnight UPS, were significantly under our actual cost. Today, we have actual weights in place on all products, based on re-weighing each item. We always try to break even on shipping at StationeryHQ. We aren’t trying to make a profit, but we also want the prices to reflect our costs accurately (rather than incorporating the shipping costs into the product’s price). In addition, I know a lot of you love the First Class shipping option on the old site, and it’s still available on both sites for orders light enough to travel that way. We will be looking to see what we can do to add back in a low cost shipping option for more orders. Jim (the GM), Mark (CEO), and I are all dedicated to offering as low cost shipping as we can! We welcome your feedback on shipping rates. If you see something that looks really weird, please do contact us! What do you think … like our new look? For the past several months, we’ve been hard at work on a site makeover—but it doesn’t just go skin-deep. What isn’t new, though, is our all-in commitment to helping you create gorgeous custom stationery and gift products. You bring your own design (BYOD); we’ll deliver awesome paper options, cool cut-outs and quality professional printing—just like you’ve come to expect. Our super-organized ordering system shows you a range of choices at a glance—products, sizes, shapes. You’ll love how easy it is to choose the perfect paper for your project, with a simple drop-down menu that lists all your options. Want matching envelopes? Rounded corners? Done! Just check the box and make your selections, right as you’re designing your order. If you need to prepare a quote for a unique stationery design, that’s a no-brainer. We make it easier for you to deliver great service to your customers. Pricing? That’s easier, too. Choose your format, style, paper, extras and quantity, and you’ll see your order total before you make a commitment. Speaking of pricing, you’ll notice that we show you retail pricing for your order. If you’re among our many wholesale customers, be sure you’re logged into the ordering system and simply click to view wholesale pricing. In the coming weeks, we’ll be adding more resources to the StationeryHQ website and our design-savvy new blog, to showcase creative ideas, spotlight some of our newest products and connect you with other talented designers. And we’d love to hear what you think of our new look. Drop us a line to share your comments and suggestions.